It’s often one of the first questions we get asked when we talk about our work in using traditional and social/digital media to foster social change. Virality is a tricky concept – often a game of chance – but with a little strategizing, you can maximize the reach of a hashtag campaign through a combination of influencers, templates, data/stats, and follow up with traditional media. The life cycle of a hashtag campaign can best be charted through example. 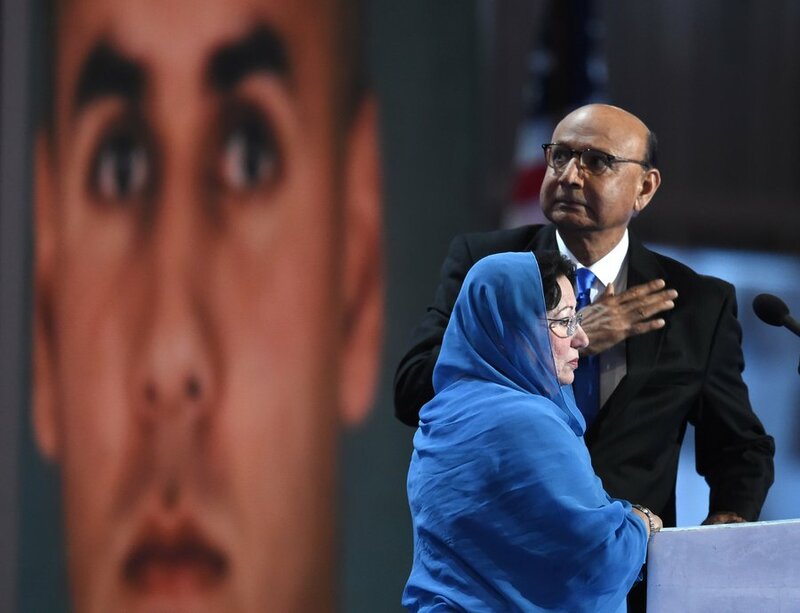 For the purposes of this post, we’re going to use a fairly fresh campaign: #CanYouHearUsNow, which went viral in the first week of August, following a prolonged battle of words between Presidential candidate Donald Trump, and Khizr and Ghazala Khan (the Muslim-American parents of deceased U.S. Army Captain, Humayun Khan) following the Khans’ speech at the Democratic National Convention. Trump insinuated that Mrs. Khan may not have spoken at the DNC as she stood by her husband’s side because she may not have been “allowed to” as a result of the faith she practices. 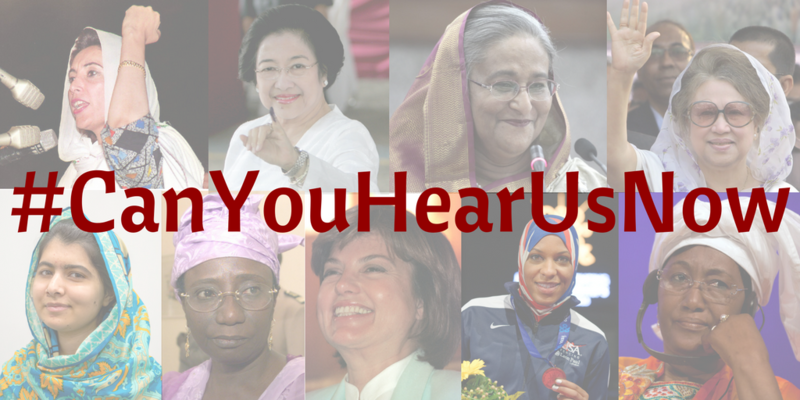 In response, Muslim women around the world tweeted with the hashtag #CanYouHearUsNow, showcasing their diverse voices, talents, and successes. 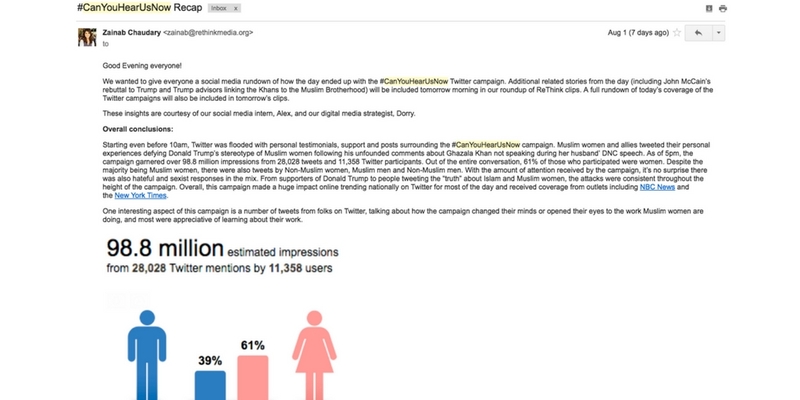 Here’s how this campaign went down (and tips you can steal for your next hashtag campaign). Before you can kick off a hashtag campaign, it helps to have ready a list of emails for members of your coalition or advocacy community who are influencers and connectors in a number of ways. Some community members may have large a Twitter following, others may be better at spreading the word about a campaign through their networks or on Facebook. Having a pre-curated listserv and individual email addresses on hand will help facilitate movement on a hashtag campaign from the beginning. Getting a coalition-wide effort going will lead to far more success for a campaign than when just a few individuals are Tweeting. 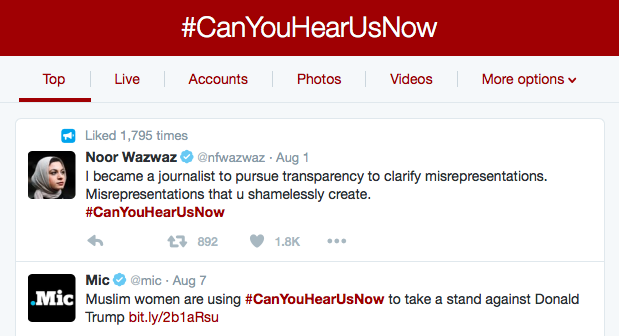 For example, #CanYouHearUsNow was a truly coalition-wide effort, in which folks brainstormed on the hashtag, execution, and implementation. This sort of campaign only succeeds when everyone is committed to making something extraordinary. The most important part of a Twitter campaign is coming up with the right hashtag within the right amount of time. Take too long to decide and the news cycle might pass you by. Conversely, not taking enough time to deliberate options can create a campaign that backfires. Think through potential hashtags to see how the opposition may appropriate the message. The choice of words in the hashtag may be instrumental to its success. Some initial ideas in our case study pitted #CanYouHearUsNow against the option #SheSpeaksNowListen. #SheSpeaksNowListen could have been interpreted to imply that women were not speaking before Trump’s allegations, but are speaking now. Conversely, #CanYouHearUsNow implies that women have always been speaking, but that the target in question may not have always been listening. Similarly, we can learn from the message testing we’ve conducted or assisted with about which messages work and which don’t. The nature of Twitter makes it less suited to influence segmented populations (unless you pay to better target your Tweets), as Tweets are public, and therefore your audience is the general public. Our message guidance indicates that words like “diversity, inclusivity, and tolerance” can actually be divisive, as those are words heavily associated with the Left and with Progressive movements, alienating large swaths of your more centrist or undecided audience. We opted not to use these words in our hashtag campaigns in order to reach the largest audience possible. Think through these factors, and try to narrow it down as quickly as possible to one concerted hashtag. This makes it much more strategic to start with a fresh hashtag and set a concerted timeframe. For us, the ideal time for a hashtag campaign like this is between 10 am to 1 pm EST (to include Tweets from the East coast and West coast during peak periods of Twitter activity). Next, send out an email to your listservs and networks 12-24 hours in advance, detailing how the campaign will work. Sending out an email with enough notice allows for those participating to draft dynamic Tweets and schedule through a client like Hootsuite, Tweetdeck, or Buffer. In this email, give a 1-2 sentence background on what the campaign is responding to and what it’s trying to achieve, followed by instructions on timeframe and hashtag for the campaign. Along with templates and sample Tweets, provide messaging guidance for allies outside of the community to use in support of the campaign. Kick things off with a Tweet or two of your own and track the conversation online. It’s important to note that Twitter searches allow you to watch both “Top” Tweets and “Live” Tweets. It’s a good idea to toggle between the two to keep track of both. One hour into the campaign, send an update email to your coalition with top Tweets to elevate and re-Tweet, including some of the Tweets coming from within the coalition, as well as any statistics you have about the reach of the campaign. (We use a program called Sysomos to track this progress and top Tweets). This keeps the momentum going and cheers folks on to keep engaging. If you have capacity, it’s also a great idea to create dynamic content – graphics or memes that those Tweeting can use for a visual component (because, as you learned in an earlier blog post, sharing photos or graphics in a Tweet leads to better engagement than sharing Tweets without graphics). In the last half hour of the campaign, send out a pitch email to reporters, using the reporter list you created before, to alert them of the conversation happening online. Populate the email with links to top-performing and authoritative Tweets and screenshots of some of the best performing visual Tweets. Offer access to spokespeople involved in the campaign for interviews. Once you get your first bite from a major news outlet, it’s a good idea to follow up with other media outlets to pinball the coverage and persuade them to cover as well. 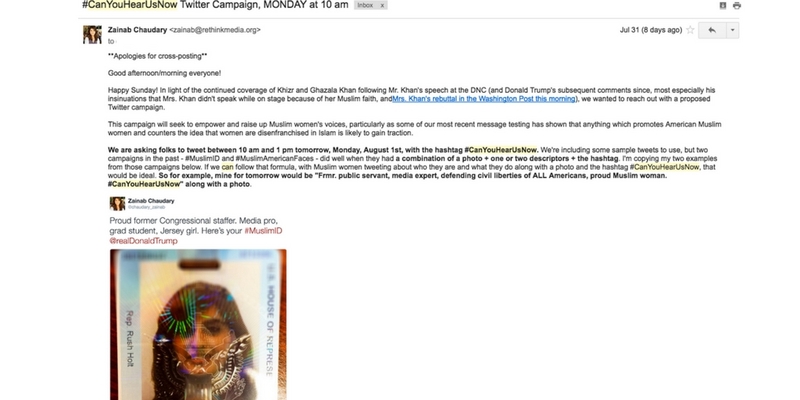 With the #CanYouHearUsNow campaign, our first bite was from NBC News, which we then pinballed in follow-up emails to other outlets we had pitched. At the end of a successful campaign, send a recap email to your coalition members to celebrate! Doing this not only serves as a much-deserved victory lap, it also helps folks feel invested and see the real data behind the impact of the campaign, which can make them more likely to participate in future campaigns. In your email, include final stats, a rundown and analysis of what the conversation looked like online, a sampling of top and authoritative Tweets, links to any significant news coverage, unique Tweets, Tweets from allies, and opposition Tweets. Rinse, and repeat with each new campaign opportunity. What are your favorite hashtag campaigns? Tweet to us @rethink_media and let us know!